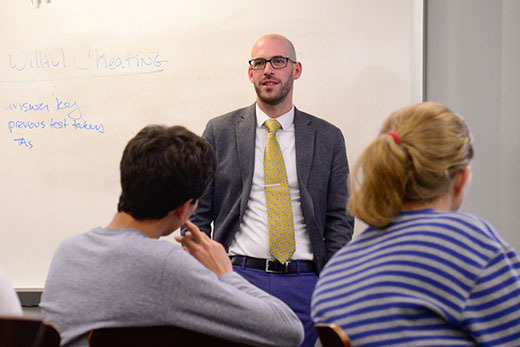 Jason Ciejka, director for the Honor Council of Emory College, created a practicum to help Honor Council members understand research on academic dishonesty, as well as the historical need for honor systems and the penalties that go with violating them. Students can soon decide if the Emory College Honor Code should get an update. The code, guidelines instituted by the student body to promote academic integrity and ensure the value of an Emory education, has not been updated since 2012. The proposed update will add a section for electronic device usage during exams and create a faster option for administrative hearings for students scheduled to graduate or take a leave of absence. The proposal also works to codify current practices of the Honor Council, clarify ambiguities in the code and reiterate that the process is academic, not judicial. Emory College students will be able to vote on the revised Honor Code in a special election that begins at 7 a.m. Monday, Dec. 5, and continues through 11:59 p.m. on Tuesday, Dec. 6. Learn more about the proposed amendments. Is there a link between an undergraduate copying an online article for a class paper and Volkswagen installing software on its diesel vehicles to cheat on emissions tests? Jason Ciejka thinks so. As an assistant dean and director for the Honor Council of Emory College, he has created a practicum for students to understand why. Simply put, it comes down to accountability to your community. The practicum began this fall to address such scholarly concerns and to tackle current events, in a bid to understand research on academic dishonesty as well as the historical need for honor systems and the penalties that go with violating them. Emory has a written honor code that sets standards and guidelines that help fulfil the College’s mission of fostering research and learning. The practicum is only for students on the Honor Council, the body charged with deciding whether other students have violated the code by plagiarizing, cheating or even falsifying records – and what to do about it if they have. Ciejka found no other universities with a similar course for Honor Council members. That puts Emory at the forefront of a growing research field with significant real-world implications. It also comes at a time when 39 percent of undergraduate students nationwide admit to cheating on tests and 62 percent admit to cheating on written assignments, according to a 2015 study from the International Center for Academic Integrity. “In today’s world, lying and cheating don’t seem to be a problem anymore, to the point where you could well think it’s only bad if you get caught,” says Judy Raggi Moore, a professor of Italian and French who serves on the faculty advisory board for the Council. The Emory Honor Council is made up of 20 students — rising juniors and seniors selected every spring — who investigate and try all allegations of academic misconduct. Before the practicum launched this fall, all students completed day-long training that focused on how to best perform their tasks. Each student was also paired with a faculty adviser for cases. Oxford College has its own Honor Council, too, for first- and second-year students at that campus. Many of the Emory Honor Council members come from the Oxford body, who have had more opportunities to be involved. Lauren Dietter is among them. The Oxford Scholar got involved as an alternate her first year, having seen fellow students and a teacher dismiss “rampant” cheating in her high school’s honors math course. The classmates then were capable of doing the work; they just felt overwhelmed. That is the same reasoning some college students give when caught, Dietter says, without realizing they are selling themselves short. “Getting involved really aligned with my morals and gave me a way to give back,” says Dietter, a senior biology major who chairs the Council this year. “The advantage of the practicum is it allows us to cover the concept and history of academic integrity more thoroughly, which I think contributes to maintaining the Honor Council’s fairness to the Emory community as a whole and to the students themselves,” she adds. The course also provides a chance to talk about integrity from different angles. For instance, submitting an original paper to more than two courses is, under a broad understanding of plagiarism, a violation. Ciejka also starts every course with discussions of integrity issues in the news. Topics this fall have included Melania Trump’s plagiarizing a Michelle Obama speech and Wells Fargo opening 2 million unauthorized accounts to generate fees. Next fall, the practicum will expand into a second-year course that synthesizes history and current events. Students will be expected to model academic integrity and create a project to educate all Emory students about its value.